I was feeling a bit better last night about quitting time and Jean wanted to go wildflowering - in the Smokys. I knew I wouldn't have to walk much to find wildflowers so, I agreed to go. I really didn't expect to see many trilliums blooming since we were there just last Sunday. We didn't see many blooms that day. I was wrong. On the Tennessee side near the Chimney Tops Picnic area we found Great White Trillium blooming and a little farther down we found lots of Yellow Trillium. So, now is the time to go trillium hunting in the Smoky Mountains. By tomorrow you should be able to find trillium on the North Carolina side near the Kephart Trail, the Kanati Trail and maybe the Collin's Creek Picnic area. Get out there! 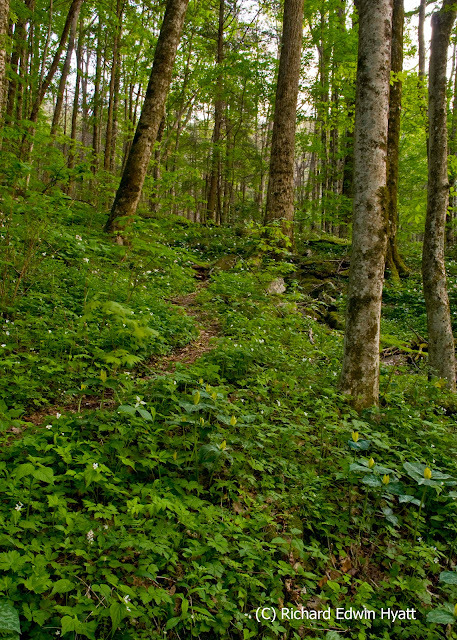 You may want to try the Cove Hardwood Trail (pictured here) next to the Chimney Tops Picnic area. I need to do a post about the wildflowers on Arabia Mountain, look out for it. They are magnificent! I took a quick peek. Will look again when I get a chance. Off to Black Rock Mountain shortly.